Are you wondering about Cambria countertops cost in Maryland? If you live in Baltimore, Annapolis, Alexandria, Fairfax, or anywhere else in the Maryland/Northern Virginia are and you want to know how much these counters will cost you, then keep reading. After you know, you can go on to design the perfect counters for your home. If you’d like to talk to a sales representative who can answer all of your Cambria questions you can also give us a call at 410-712-0601. You can also click here to fill out our online request form. What Goes Into the Cost of Cambria Quartz? Like any other material, a lot of different factors determine just how much you can expect to spend on Cambria quartz countertops. If you’re interested in purchasing new countertops, it helps to know just what you’re paying for so that you can have a better understanding of where your money is going. Color – Cambria quartz, like many other options that are out there, has a variety of colors out there to choose from. One thing you need to keep in mind, however, is that some of these colors are more popular than others. Because of this, the more sought out colors will cost you more to implement into your kitchen design. You shouldn’t let that fact discourage you, because there is something out there that will fit in your kitchen’s design. You might find a little known color that will make it much easier for your kitchen to stand out. Size – How much do Cambria quartz counters cost per square foot? That’s the question many homeowners ask when considering Cambria countertops cost, and the answer will depend on what you need to cover. 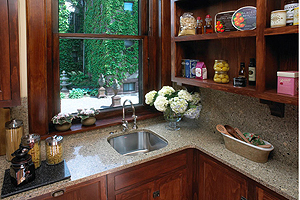 Cambria kitchen countertops will cost considerably more than vanity tops, so you need to think about the area that you are going to cover when looking for the cost of your countertops. Maintenance – How much do you expect to spend on maintaining your counters? When you purchase new fixtures, you want to think carefully about how much maintenance will be needed. Fortunately, this material saves you money thanks to its durability and low maintenance needs. Cambria quartz is spill proof and doesn’t need to be resealed. In many cases, a simple wash with warm water will clean the surface of these kinds of counters. These are three of the primary factors that drive the cost of Cambria counters, so think carefully about them as you shop. Because no two installations are the same, pricing of a project involving Cambria quartz can be unique. In order to make sure you get the most for your money, however, you need to work with a countertop installation contractor who knows how to get the job done right. Here at Express Countertops, we’re all about quality. We get quality materials from top-tier manufacturers and the installation service that we provide will ensure everything comes together perfectly for a strong presentation that will have you appreciating your kitchen’s look for years after everything is said and done. The only way to get the perfect kitchen is to have the best in the business work on making everything come together. With the experienced and certified professionals of Express Countertops, you will get just that. We’re ready to start when you are. Get in touch with us today for a fast, free estimate by calling 410-712-0601 or clicking here to contact us online. We’ll discuss Cambria countertops cost and anything else that needs to be discussed before we move forward with your project. With our 7-day installation guarantee, you could have new counters before you know it!